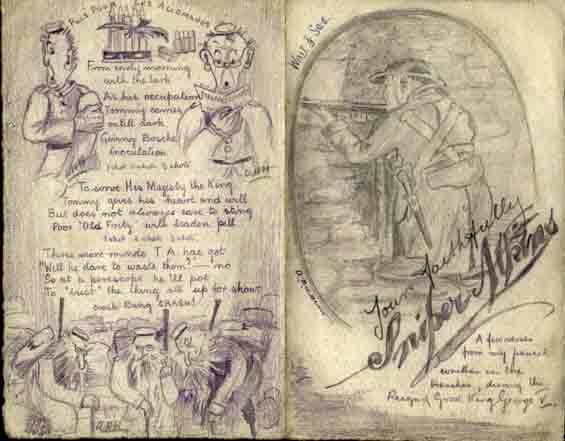 Private Bertie Hibbett illustrated many of his letters in the Field. ‘The Z -Urban District Trench Improvement Society. ‘Bully Beef Bungalow’; ‘ Whizbang Dugout’; ‘The Listener’s Lounge’; ‘Somewhere Else’; ‘All in Bandages’; ‘In Red White and Blue’ and once or twice he has ’20 Yards from The Enemy!’. These ‘addresses’ were a great help when trying to place a letter in its chronological order. Smiling Letter Flying Home from France. 1916. 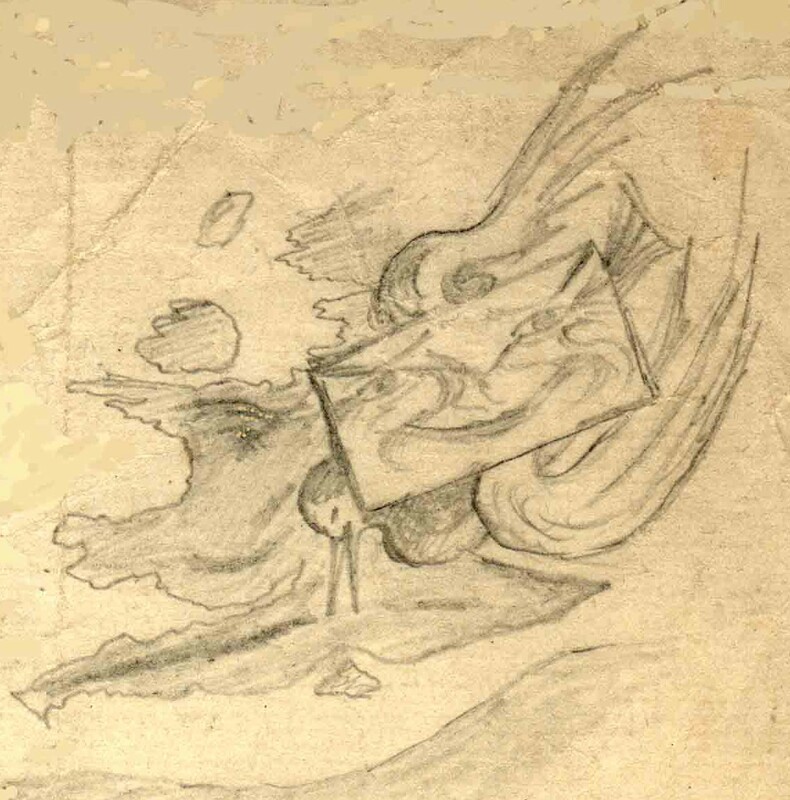 DECORATIVE LETTER HEADINGS : Most of his drawings were of necessity in pencil but , when he had time, Bertie provided illustrated headings in ink; e.g. before embarcation and when in Hospital in France. Uphold the Knot. 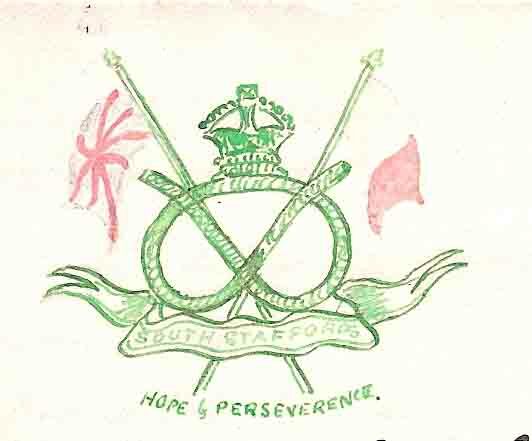 Decorative Letter Heading : S.Staffs Knot Badge. Feb. 1915. SKETCHES : Pte Bertie Hibbett was detailed as a Sniper in 1916. When, as a child, I asked him if he had killed anyone in the Great War, he said he thought he had – ‘once’, when he fired at a helmet and heard a shout. He was also detailed by HQ, perhaps more successfully, to make sketches with a periscope of the German Front Line at Gommecourt. He brought Home a copy but sadly he showed it at a ‘Toc H’ exhibition in Lincolnshire in the 1960s and we never saw it again. Sniper Atkins Doggerel. Fonquevillers, near Gommecourt. Before the Big Push. May 1916. Bottom Left: Old German Soldiers “with long beards observed digging trenches”. Right : “A fellow soldier posed for me” . ENVELOPES : WHITE envelopes were censored by the Regiment. GREEN envelopes need not be censored by the Regiment but their contents could be examined at the Base. 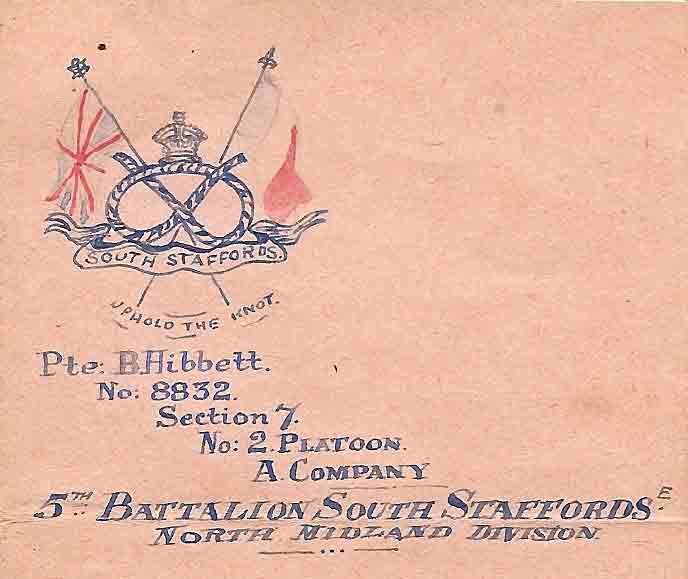 Soldiers had to sign:- ‘I certify on my honour that the contents of this envelope refer to nothing but private and family matters.’ Pte Bertie tells how sorry he feels for the censors wading through the huge pile of letters before the Battle of the Somme.